Potting soil comes in many forms. It can be manufactured and sold in bags, or it can be a mix of soils and organic matter that a local supplier sells for potting. Still other potting soil is a homemade mixture of soil, compost, sand, organic materials or other components deemed beneficial to potted plants. Although not poisonous in itself, potting soil can become poisoned via several means. A majority of potting soil is completely benign to humans and, unless contaminated, benign or beneficial to plants. Packaged potting soils are often sterilized. Even unsterilized potting soils often have a plethora of beneficial organic matter that suppresses harmful microbes. 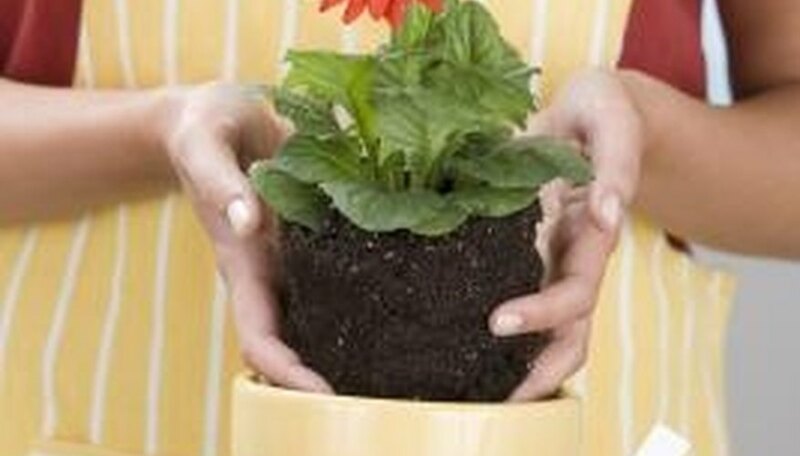 When made correctly and used correctly for planting purposes, potting soil is not poisonous. Poor packaging practices can allow pathogens or poisons into the potting soil mixture. Processing plants that allow foreign chemicals to come in contact with soil processing equipment cause soil contamination problems for consumers. Homemade potting soil that is not sterilized may contain pathogens, especially if added compost or added manures are not fully or properly decomposed. Potting soil used in planting containers with contaminants might absorb the contaminants and become toxic. Soil-borne pathogens in potting soil can harm or kill plants, though this does not make the potting media poisonous per se. Excessive use of fertilizers can lead to toxic amounts of certain nutrients, improper pH balance and a buildup of salt. Over time, the potting soil becomes poisonous to the plant. Flushing the potting soil several times with clean water helps to alleviate these poisons. This does not help with potting soil in contaminated containers; the soil must be remediated based on the type of contamination it suffered and moved to another container. Potting soil used to grow poisonous plants such as dieffenbachias, poinsettias and oleander may be contaminated with the plant's poisons. Many plant poisons break down quickly in the soil, long before they can cause harm to pets, wildlife or people. Other plant poisons take longer to break down naturally. Handling the soil while it is still full of plant toxins makes the soil poisonous.